.......53 Buddhas and Me .................My Life Adventures.....: Flower & Garden Show. 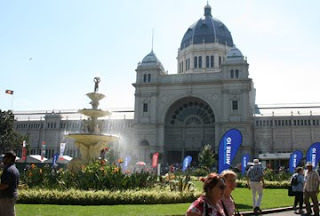 Exhibition Building and all through the gardens surrounding it. 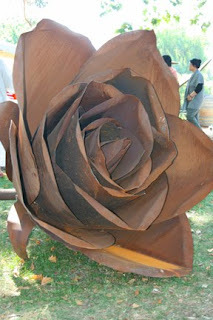 This imitation rose was huge, it would have been around 4 - 5 feet square. "Davine Time" update: Today I had my haircut, it was getting really long and starting to drive me crazy. In my past life (15 - 19years old) I was actually a hairdresser, so I am usually pretty picky when it comes to who cuts my hair. I must say I have found the best hairdresser. Hayley is my friend Alices daughter in law and she is very nice. But her best feature when it comes to hair is that she actually cuts it exactly the way I want it. Thanks Hayley. I love that rose, it's made of iron? I thought it was made from wood until I reread your post. I'd love to have one of these roses for out at the farm, that would be such a cool idea. That's awesome that you have a good hairdresser, what ever woman NEEDS!